The uses and abuses of architecture, that subject that interests me but which I barely dabble in, got my attention again recently through an article by George Packer in the Feb 1, 2010 issue of The New Yorker. 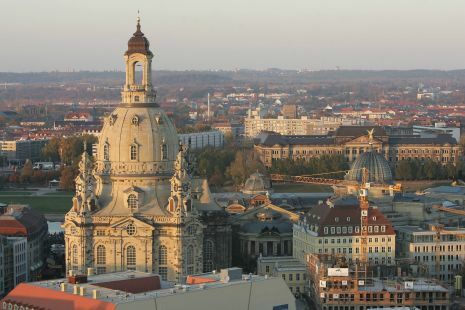 In his “Letter from Dresden: Embers,” Packer writes that the German city “has the unstable character of a place with a romantic self-image and a past that it would rather not discuss.” But we will discuss Dresden’s past, and ask also, if its latest building project in present time is vandalism, or an enlightening statement. Before reading Packer’s piece I was fairly ignorant about this city, but as is often the case with New Yorker articles, this one led me on several tangents. 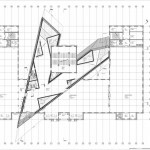 The gist of Packer’s thesis is that Dresden is well served by having a gutsy architect like Daniel Libeskind to design its new national military museum, because the artistic violence of his plan is exactly what Dresdeners need to shake them out of their nostalgia and set their view of history straight. Since reading that article I’ve gone on to learn a little more about the architect, the city, and what took place there toward the end of World War II. I also happened to read a novel that ties in to the reluctance of Germans to talk about the war and come to grips with that painful history. Of course, I haven’t taken my own photos. But if I do get to Germany I’ll be sure to visit these buildings and write another more personal blog post. For now, I want to set down what little I learned–I should say, the questions that have been raised–and if I put it here it’s available for anyone else who might like to know. It was on February 13, 1945 that the Allies bombed Dresden, an event that some say resembled the horror of Hiroshima, and that the Neo-Nazis brand as equal to the Holocaust. What troubles people about the Dresden of today is the city’s selective reporting of its history, the portrayal of its wartime past as only victimization. 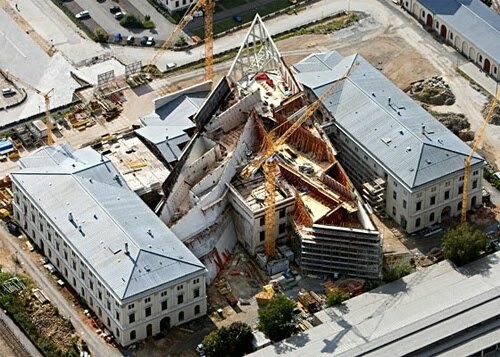 It was the Jewish Museum in Berlin, shaped, as one person said, “like a deconstructed Star of David,” that in 2001 made a name for Polish-American architect Daniel Libeskind, the one chosen to design the Military History Museum in Dresden, a renovation of the former military arsenal building that has been serving as a museum since 1897. Not everyone likes this architect’s style. 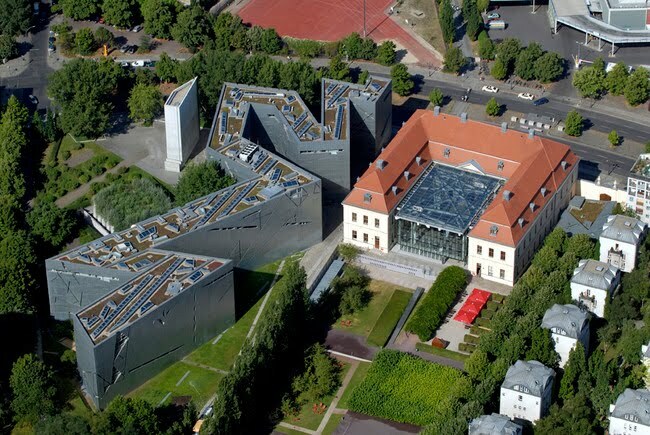 Back in 2003 Deroy Murdock cautioned against Libeskind and his art in a National Review article quoting heavily from the architect’s own words, poetic and otherwise, calling his poetry grotesque and his Berlin museum ghoulish. Murdock was lobbying against Libeskind as a contestant in the running to design the new World Trade Center in New York, and in fact, he did end up designing the overall site plan. 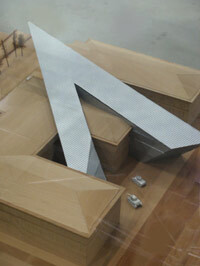 I must admit that Libeskind’s poetry strikes me as twisted and broken, not lovely. But history shows mankind to be perverse as well, and Libeskind thinks it’s healthy to face one’s past and its ugliness, so that you can get a more balanced and true understanding of reality from which to make progress. The arrow-shaped addition to the old museum, cutting through the building just as the Holocaust made a gash through the 20th Century and human history, nonetheless rises to a higher elevation where visitors will get a broad and fresh perspective on the whole city, a view that wasn’t possible from the former museum. It’s these philosophical question marks that get my mind’s wheels turning. I can see how trying to recreate the city as it was in the 1930’s would convey that you want to go back to that better time. But was it any better, the society and people who participated in the extermination of their fellow humans? Even if it were, going back is not an option. We need to live where we are now, and go forward, trying to learn from the past, even though it speaks to us of our failings. What an interesting and thought-provoking post! Thanks, GJ! Another book tangential to this subject that might interest you is called, “My Life with the Great Pianists.”It's by Franz Mohr, who traveled with Horowitz and tuned his performance piano for him. (What a fabulous job!!) Anyway, this man was from Dresden, and was in the city on that fateful day. His 1st hand account of his survival is riveting. I met him about 10 years ago in Iowa, when he came to speak at our boarding school. He is a wonderful Christian man, and his life is exciting to read about. Kurt Vonnegut's novel Slaughterhouse-5 is about the bombing of Dresden; it made a profound impact on me when I read it many, many years ago. So interesting to read about Daniel Libeskind's thoughts on the city's architecture and rebuilding. I grew up some in Germany and have traveled there as an adult. I'll always remember Freiburg, which was heavily bombed during WWII. When they rebuilt it, they used the original, medieval plans, so that it was exactly the same as before. I thought that was fascinating. This is interesting; I can see why you spent time researching! But I have a quibble: my husband's training and subsequent lecturing to me about the merits of classical architecture has made me suspicious of postmodernists like Libeskind who want to make their patrons uncomfortable and to force them to think. Granted, trying to recreate the past too precisely sometimes results in a sentimental/themepark like effect. But, on the other hand, for how many years can you exist in/with a building that is a criticism of the human person? At some point, I would think, the discomfort will fade and the intended self-conscious effect won't take place. Wouldn't it be more healing to build structures that promote healing, rather than criticism? Couldn't you say that the old building doesn't represent a severe authoritarian past, so much as an orderly past, a past that preceded the Nazis by centuries, and an attempt to restore order is an act of hope? Whereas the architect who intends to break self-delusions promotes a discomfort with the self that leads not to hope but to melancholy? Sorry to go on at such length! I am not opposed to innovations in architecture, but sometimes I wonder if some contemporary architects try too hard to be startling, instead of trying to come up with designs that suggest harmony. Maybe I'm too soft to appreciate these designs. I came back to apologize for being long winded and contentious in the comments. And I want to say thanks for taking the time to write up this thought-provoking post. It has me thinking about many issues! 1) Order. But not over-simplified. We like to see complex elements arranged in a regular pattern. I was wondering if perhaps a museum might get away with such a brash statement, where being made to think isn't a bad thing, but you are probably right, the statement will lose its effect. (I hope in the meantime it squelches those Neo-Nazis a bit)…and yes, the jarring buildings fail to offer hope or show harmony. But without reference to or undergirding by the Christian gospel, an artist is unlikely to find those elements, and will drift from melancholy right on to nihilism. Hi again, GretchenJoanna! I think your last statement nails it on the head – these particular innovations don't seem to have that undergirding of the Gospels, unless I'm missing something. And since architecture is a public art, I agree with de Botton – it is a kindness to be a little boring, although beautiful architecture certainly doesn't have to be boring. I agree with your comment about museums, too – coincidentally, this summer we went to the Marine Corps Museum in Quantico, VA, which has a very similar slanted pyramid design which is supposed to recall the photo of marines raising the flag at Iwo Jima. (and a statue is right in front of the museum so that reference isn't missed). But in the case of the MCM, the glass pyramid doesn't interrupt another building like Libeskind's design, since it's located outside the city and rises above the treeline and catches the sunshine. So a very similar design in a different context has a completely different effect. Likewise, I couldn't help thinking of another glass pyramid, the one designed by IM Pei as an additional entrance to the Louvre. I don't know the philosophy behind it, but it just strikes me as out of context and so a little silly, like a non sequitur comment. Maybe there is some reason for it's being, but it was lost on me, your average tourist. Now I'm inspired to look up more museums for comparison – and to read more about Dresden. Thanks! I was interested in reading this post because I was born in Germany and my maternal grandfather was actually from Dresden. However, I know very little about him, as he died before I was born. My relatives did not talk about the war years..too many painful memories. I had one uncle who was a German POW and kept a scrapbook of his imprisonment. He had high regards for his American captors. Your article has certainly sparked my interest in this fascinating subject and tragic era. How did I miss seeing this post? I am glad you wrote part 2 with a link back. I am also appreciative of the wonderful readers you have gathered who have written here. How art or architecture will effect any one soul can't be determined. Whether statements and impact can weather the generational shifts is also a question, or whether even in individual lives a “desired” impact will be sustained. Mankind is so often building, overtly or covertly, monuments to self, towers of Babel… perhaps what we teach each other in the buildings, do for one another in the bulidings needs to be a more central focus. I don't have any answers ( but the One ) and am just contemplating outloud amongst you others who I find very tender and thoughtful and so I thank you, dear Gretchen and your readers. I truly missed out on a fun discussion here by commenting first and not returning! The ideas and wisdom expressed are inspiring. I wonder if architecture is a bit like literature. No one pretends to really know NOW, which current literature will last, will be “classic” and universal, will be representative of its age. We find that out later — 50 years from now, when today's authors and readers are all dead. Will this museum, the Louvre pyramid, the new World Trade Center and others be appreciated later as monuments of insight? What do we want a building to be? Do the architects express themselves, or try to please the public? We freely admit that good stories speak to our human bones; there are timeless themes and struggles. Perhaps architecture is the same, and architects should look for ways to incorporate the timeless. To be forever seeking to invent something new and shocking, is a sure way to fail. God is orderly, and man in his sin falls naturally into chaos. We need no reminders of this. In striving for order, for beauty, for timelessness, we reach for God and eternity, and we engage in an inner war against our own chaos. Like you, I doubt some modern architects consider these theological truths.